Transportation Costs > How Much Does a Dune Buggy Cost? How Much Does a Dune Buggy Cost? A dune buggy is a recreational vehicle with large broad tires designed to be used on sand dunes, beaches and even in the desert. It is known by a variety of names. In the United Kingdom, it is known as a “beach buggy,” for example. On the other hand, those designed specifically for the open sand spaces are often referred to as “sandrails,” while a dune buggy, which is designed more for off-road, is known as an “off-road go-kart.” The difference between them lies in the kind of tires fitted on the vehicle. According to ATVTraderOnline.com classified ads, a dune buggy can be as low as $1,100 to as high as $15,000. Just like a vehicle, there are going to be so many factors in the pricing, but the average for a new dune buggy was $2,000 to $8,000. The popular VW dune buggy used can cost anywhere from $2,500 to $9,500. For example, at the time of this writing, there were a few eBay listings for $2,500 and $9,500. If you would like to rent a dune buggy, the rental rates will usually be from $50 to $150 per hour. This will depend on the location, the rental company, and the type of dune buggy. If you are going to rent a dune buggy, be prepared to sign waivers or purchase temporary insurance to protect you and the rental company. There are generally three types of places you can drive your dune buggy – on the sand, dirt, or the street. It is possible to have dune buggy that can be driven in all types of terrains but a specific dune buggy built for a specific terrain will perform better in that terrain. Sand rails have smooth tires, do not have front brakes, and is lighter since it has paddle tires for getting around dunes. 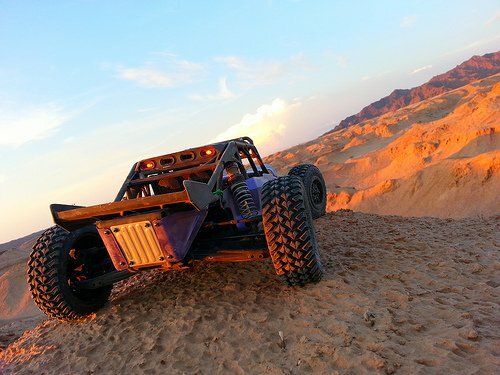 These vehicles have powerful engines, making them really fast compared to other types of dune buggies. Trail buggies are often driven over hard surfaces. They have reinforced frames to better protect the occupant and a more reinforced shock system to give a smoother ride. The vehicle has front brakes and has threads on its tires. A fiber glass buggy is more often than not driven on streets but some can also be built for off-road use. The bodies are usually more fragile and require extra care. Common engine power of a dune buggy includes 150cc, 250cc, 300cc, 400cc, 800cc, 1000cc and 1100cc. Models can often include an electric start, remote start, lights, adjustable speed control, dual wheel drive and a battery tender. Dune buggies can vary in vehicle size. Some are made for only one person while others are made for two to four people at a time. If you rent a dune buggy, the rental charges will include an allotted amount of time as well as transportation of the dune buggy to the site you will be riding. At most rental sites, the longer you ride, the less you will have to pay per hour. Additional accessories, such as steering racks, off-road suspension seats and performance trans-axle parts, should be budgeted for if you wanted it. Like a vehicle, repairs and maintenance will be required throughout the life of the dune buggy such as replacing the tires, oil changes and a new battery. These prices can be very close to what you would pay for a typical car mechanic visit. Due to the size, dune buggies that are purchased over the internet can often incur higher shipping freight charges. Extended warranties can cost around $150 to $300 to protect your investment. Just like a car, you need to insure it when driving in public spaces. Dune buggy insurance, depending on your policy can cost $500 to $1,500 per year. Consider checking out eBay and Craigslist to see if you can find any used models in your area. This is a great way to save up to 40 percent. With so many makes and models on the market, you will want to make sure that you know what you are going to use the dune buggy for. Is it going to be for the backyard? The desert? Larger hills? This will help you determine what size engine you will need for your adventures.